Recent headlines in the Seattle Times job market section announced that the “Class of ’06 grads find prospects encouraging.” The gist of this article is that more college grads will be graduating with jobs this year than in the last two years. The article highlights who’s hiring. Enterprise Rent-A-Car leads the list with 7000 new hires followed by Lockheed Martin and Walgreens with a little over 4000 new jobs. A trio of national accounting firms comes in at about 3500 hires followed by the U.S. Department of Agriculture and Schlumberger, an oilfield information services company, at 3000 jobs. This is certainly good news for those students who have made it through high school and college, and majored in areas that emphasized the math, science and technology skills that these jobs require. In a recent survey, Southern Oregon educators report that their students are expressing a relatively low interest in technology programs despite continuing demand and high income potential for those who choose technology-related careers. This trend of students shying away from math, science and technology-related careers has recently drawn national attention. The blue ribbon task force responsible for Tapping America’s Potential raises the challenge that in order for the U.S. to compete in world markets… “We must double today’s science, technology, engineering, and mathematics graduates with bachelor’s degrees by 2015.” The report makes it clear that it will take a focused, long-term, comprehensive initiative from public and private sectors to make this happen. For rural students and their teachers in Southern Oregon, the report’s second recommendation is of special interest: “Motivate U.S. students and adults, using a variety of incentives, to study and enter science, technology, engineering, and mathematics careers, with a special effort geared to those in currently underrepresented groups.” How do rural schools with sparse resources motivate and offer incentives to encourage their students to consider career math, science, technology and engineering? Poverty and distance often mean that students in some of SOESD’s most rural districts have not traveled even to Portland, Oregon’s main metropolitan area. Rising transportation costs will increasingly limit travel opportunities. Some of SOESD’s most rural schools struggle with providing basic education to students. A high number of these schools have higher than average drop-out rates while others have low enrollment of females in science, math and technology courses. That may be about to change—thanks to a unique $220,399 distance learning grant announced today by the U.S. Department of Agriculture. The funding will help SOESD bridge the “digital divide” with videoconferencing technology. 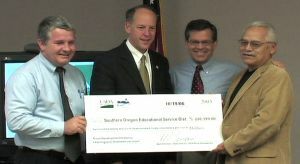 Southern Oregon Education Service District's was one of only 46 education applications selected this year to receive funding from the USDA Rural Development Distance Learning and Telemedicine Grant Program. The pilot network will feature the use of a full-featured mobile IP video conferencing equipment package at eleven elementary schools (K-6), one middle school (6-8), and five combination junior/senior high schools (7-12). Using mobile Interactive Video Conferencing (IVC) equipment allows every room in each of our seventeen pilot schools to be a potential distance education end-user. Access to cultural opportunities and exposure to a variety of career paths is not a “given” in these schools. The technology supporting this program includes videoconferencing units, which will have the ability to move from classroom to classroom. This technology will integrate with existing technology infrastructure to provide access to a wide variety of distance learning opportunities.